To give color to your life, I present these pins hair declined in six versions. Brown version: set of 3 hair flowers made of split leather Brown and mauve pins. The flowers are mounted on a pad made in small black natural straw and their diameter is 4 cm. Green version: floral interpretation made of cotton and Ribbon of lace-straw yellow mounted on hair pins, Bobby pins. The diameter of the largest flower is 7 cm and 5 cm for the little one. Beige version: set of 3 Bobby pins to accessorize your hairstyle for formal or every day with a floral touch. They are made of natural raffia and black beads. The diameter ranges between 3 and 4 cm. These hair pins will add a note of sweetness and tenderness to your hairstyle in all circumstances. 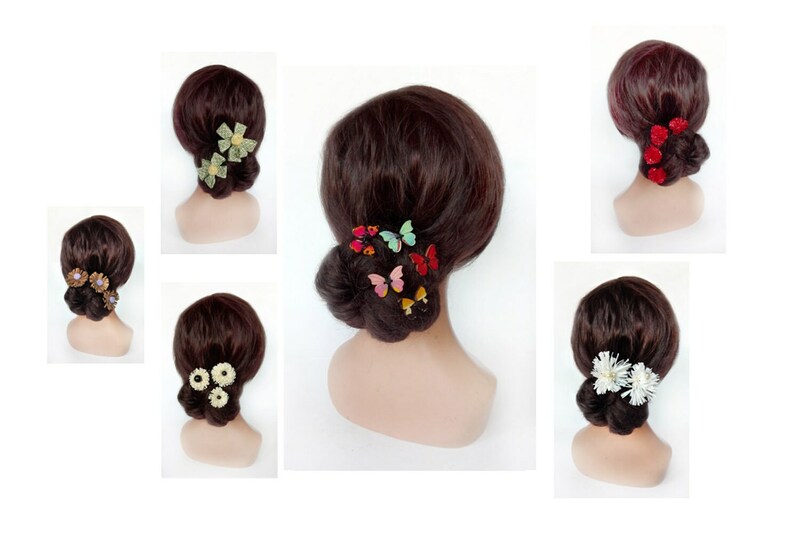 Multicoloured version: set of 5 hair pins Butterfly hair pins made of painted wood. The butterflies have a diameter of 2 cm. Perfect for any ceremony, they give an air of spring to your hair. White version: Bobby pins made with raffia fringe and beads imitation Pearl hair pins to accessorize your hair of ceremony, wedding or every day with a floral touch. Red version: bunch of hair pins made with red fabric with printed gold. The diameter of a tassel is 2.5 cm. Unique and is sent with tracking number.